GetLinked® Software Forum • View topic - I receive a message that states that GetLinked can't find the file for employees? I receive a message that states that GetLinked can't find the file for employees? Post subject: I receive a message that states that GetLinked can't find the file for employees? The most common finding for this error is that there is no Employee file available in the folder where it normally gets copied so GetLinked Software can import it. 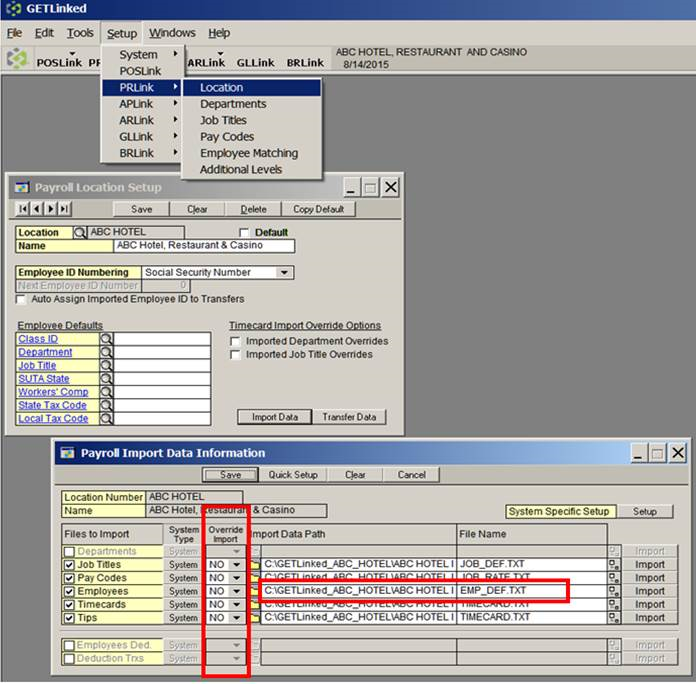 In GetLinked Software there are “Import Data Path” and “File Name” fields for employees. - Look at these fields and using your Windows Explorer find the employee file in that path. Be very precise with the correct pathname and file name as many paths and filenames look very similar. - Most of the time these files did not get transferred correctly or at all. - Re-export and/or copy the employee files from point of sale (POS) system to the correct GetLinked Software directory and GetLinked Software will import the records you are requesting. Usually your polling software did not complete the night before or was interrupted and did not get all the files copied to the GetLinked Software directory.